Medical Conditions Gordon has a history of drug and alcohol abuse. She has been diagnosed with schizophrenia and was prescribed medication to control the condition, but she wasn't taking medication at the time of her disappearance because she did not believe she was ill.
Distinguishing Characteristics Caucasian female. Brown hair, blue eyes. Gordon has a tattoo of a bleeding rose on her left shoulder, and a three- to four-inch scar on her right calf, and a horizontal scar on her upper lip. She may dye her hair. Her nicknames are Jen, Jenna and Jenny, and she may use the last name Loomis. Gordon was last seen in Watertown, New York on September 10, 1997. 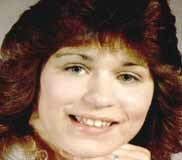 A week prior to her disappearance, she had been discharged from a community psychiatric facility. She has never been heard from again. She has left home before, but had always kept in touch with her loved ones every few weeks by phone. None of them have heard from her since her disappearance. Her mother reported her as a missing person 40 days after she was last seen. Gordon has led a transient lifestyle in the past and has previously lived in Florida and North and South Carolina. At the time of her disappearance, she and her mother were fighting over custody of Gordon's young son. Her mother later adopted the child. Few details are available in Gordon's case, which remains unsolved. Updated 6 times since October 12, 2004. Last updated July 17, 2010; distinguishing characteristics updated.